Steve Sekley’s 1962 film adaptation opens in much the same way as the source novel: Bill Masen, the film’s brawny hero, convalescing in hospital following surgery on his eyes. With his eyes temporarily out of commission, Masen is unable to witness the spectacular meteor shower that lights up the night sky the world over. And when everyone discovers that they have gone blind the next day, Bill is one of the few people in London who are still able to see. Bill witnesses the chaos that grips central London, and resolves to return to his ship (he’s a sailor), picking up Susan, a child who can still see, along the way. Aside from rendering the vast majority of the world’s population blind, the meteor shower has another sinister effect: triffids, gargantuan extra-terrestial plants deposited on earth by an earlier meteor, have become ambulatory, and are attacking and devouring the defenceless population. The Day of the Triffids features some genuinely unsettling scenes. After leaving the hospital, Bill Masen crosses an eerily-deserted Westminster Bridge (so we now know where Danny Boyle borrowed that idea from). A train, the driver blind, crashes into the station; the panicked passengers fall over one another as they attempt to disembark. A passenger ship, its crew and travellers sightless, drifts aimlessly in the middle of the ocean. The crew on an airliner fruitlessly radio for a ground crew to assist them in landing; the terrified passengers, suspecting correctly that the plane will soon run out of fuel, begin to riot, trampling an airhostess (this viewer was reminded of United 93). The scenes described above all take place within the first 45 minutes of the film’s running time; during the film’s second half, the film loses focus and the plot meanders a bit. The action shifts to France, and then on to Spain, for no good reason that El Tarangu could discern. Aside from the Bill Masen storyline, there is also a secondary storyline concerning the Goodwins. Tom and Karen Goodwin are two marine biologists, their marriage on the rocks, who were conducting research in a lighthouse off the coast of Cornwall the meteor shower occurred. Stranded in the lighthouse, and with triffids roaming about outside, the Goodwins are engaged in a race against time to discover a chemical substance to combat the triffids. El Tarangu kept expecting the two disparate story threads to come together at some point (particularly when Bill Masen’s character starts sailing around in a boat), but they never do. The Goodwins’s storyline had no bearing whatsoever on the film’s plot; sure, Janette Scott looks great and screams at the requisite times as Karen Goodwin, but the lighthouse storyline could have been dispensed with altogether. 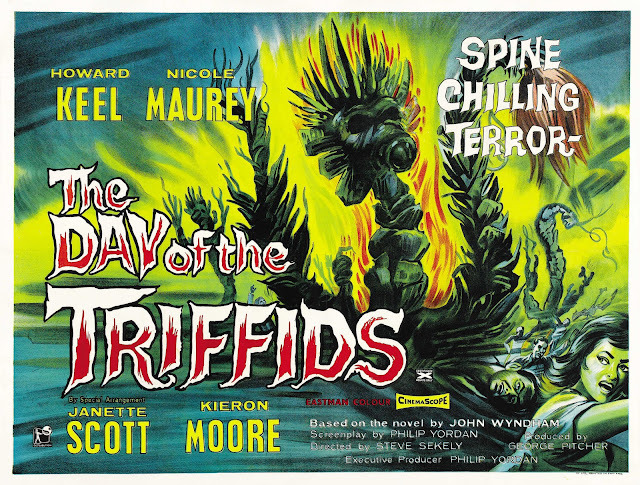 Some of the special effects look a little bit hinky by today’s standards (at some points, the triffids move in exactly the same manner as a prop shoved along on a dolly would), and the plot careers all over the place during the film’s second half, but there are some pretty spooky scenes, and the triffids themselves look pretty awesome; The Day of the Triffids is good fun. But for heaven’s sake, if you intend on watching the film, don’t ruin the book for yourselves by watching the film first. Whatever about the uneven quality of the film adaptation, El Tarangu unreservedly recommends John Wyndham’s excellent novel. Buy the novel The Day of the Triffids from Amazon; only then should you buy the film. Image from and Passenger Films. For a slightly more in-depth analysis of the similarities between The Day of the Triffids and Danny Boyle's 28 Days Later, see Deadly Movies' post on the topic.